Teachers love doing their own thing. It’s liberating…. but is it always? 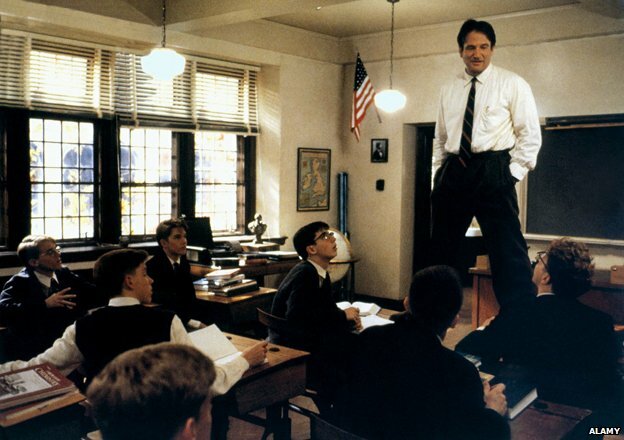 I’m sure you all see a bit of yourself in John Keating, striding across the desktops inspiring the pants off your eager students day in, day out; fighting the straight-jacket of conformity; punks in the world of prog rockers; mavericks defying the powers that be….. We all want to do our own thing right? To be free to express ourselves; to teach how we want to teach; to teach what we want to teach… and above all, to be left alone. producing or sourcing high quality materials – (my own Powerpoints and worksheets are rubbish). Of course, I might want to contribute to discussions about these things;I should pull my weight where I can – but I’m happy to follow the plan. In fact, I really want there to be a plan to follow – even if I deviate mischievously from time to time. I want to choose the resources; not make them. I want to teach so students can do well on the tests; I don’t want to have to write all the tests myself. And then there’s the question of collective responsibility. It’s easier for students and for me if we can all agree on some common experiences. Is it right if the number of achievement points a student receives is more a function of who teaches them than how hard they work? Is it sensible in a big, complicated school for students to have different rules in every class, different sanctions and different expectations about basics like uniform, equipment and putting hands up to answer questions? I’ll gladly sacrifice my autonomy to support the idea that some common ground, some consistency between us is a good thing. If developing oracy skills is a whole-school priority, I’m going to play my part – why would I want to opt out? Who gains if I secretly abstain or contribute to the inertia? No, I’m not going to put the objectives on the board, or do a three part lesson or use a specific colour pen for marking; no, I’m not going to feel bad for doing a lot of explaining from the front and being a bit of a Luddite in regards to the IWB gizmoscope. But I only want a bit of autonomy. Not too much. Please, don’t give me too much…. I want to be part of a team where the planning is shared, where the resources are good and available to me, where I don’t have to make curriculum planning decisions as if they’ve never been thought through by anyone else before. This was especially true when I was just starting out; it’s also true now I’m teaching new things in a new context. There’s a fine line between being given autonomy and being left to sink or swim – or to being given the option to close the door to better ideas or to drift into mediocrity. I’d happily sacrifice some autonomy to stay on the right side of that line – for the benefit of my professional development, my workload and for the good of my students. « Rethinking marking and feedback. It’s all about the response. I think as a seasoned teacher who is not a school leader that I’d far prefer to begin from a position where I’m afforded significant autonomy and be invited to make my own decisions about the degree to which I’d like to work collaboratively or access pre-created resources. Ultimately I still have faith in a teacher’s ability to determine for themselves when they need professional support and when they are best to trust their own judgement and develop classroom work and practices to meet the unique needs of their students. If they’re then not accessing or replicating the practices or materials of the wider school, perhaps the initial assumption might be that these are not seen by the teacher as suitable to the needs of their classroom or students – rather than that the teacher’s solutions are automatically inferior. I’m concerned at the tone of the last line of your piece, and the title, which appear to infer that to operate with higher levels of autonomy than those you suggest in this piece would be to the detriment of my “professional development, my workload and […] the good of my students”. I could develop a case to argue the opposite – in fact, my whole department is an argument against your premise here. Perhaps this is the difference between the perspective of the senior leaders of a school and those who are still largely operating in the classroom? I don’t think so. It’s an argument for collaboration, shared planning and doing things together. I see too many teachers with too much to do, feeling their way, working side by side but not together with colleagues. I’m reflecting my experience of working in departments as a teacher, not trying to get people to do stuff I want. I think we can over estimate the extent to which people have the skills and confidence to act autonomously – especially in some technical areas. We’re probably all way too touchy about accountability and the open door policy is less real than we’d like to think. Schools are full of lonely teachers flying solo. That’s my angle. Sometimes autonomy is just too hard. I don’t dispute the intention of what you’re saying, and I’m certainly not arguing against supporting teachers, but I would still contend that of all the things about teaching in the UK that I’ve found ‘just too hard’, any freedom I’ve had to do things my own way has not been high on the list. That’s probably true for someone like you. You’re the kind of expert teacher others need to learn from. I suppose the automony I worry about is for less experienced people and, in all honesty, in cases where the quality isn’t there. Hi Tom, there are many ways to collaborate but shared planning isn’t one of them. All that team work holds you in a vice like grip. Don’t stray from the plans you all worked so hard on, etc! I have always liked working on my own planning specifically for the needs of my class. I understand secondary is different but Primary teams who plan together sometimes sacrifice flexibility and the ability to be led by childrens interests and more importantly, needs. It all depends on who is in the team. You might not value or need the shared planning but your colleagues might. Everyone ends up doing their own thing to an extent – it’s a question of degrees and context. Although I’m generally a fan of team (or what we might also call ‘group’) work, I do think that some of the same issues that you get with children working in groups also tend to apply when adults work in teams. One person can tend to take over, and push their ideas onto others, even where those ideas might not suit the personality type of each individual. Those who prefer a quiet life might say ‘okay’ and get on with doing what the team leader says, but you can end up with low level resentment which has a habit of festering. I like the idea of teachers as ‘magpies’ – grabbing what ‘works’ for them and discarding what doesn’t, depending on their own individual teaching style as well as on the kind of class they are teaching. I would worry that by pushing for uniformity and conformity, you might discourage creative people from staying in teaching or in your setting. (I’m not saying that this necessarily applies to me, but I definitely couldn’t work in a school where there was a high level of control over how I taught – I would feel disempowered about the bit of the job that I love the most). The point about inexperienced teachers is surely that they need better, longer training, and that we need to look for ways to ensure retention of teachers with experience in the profession? If you hand new teachers a format for what you want them to do, I worry that they won’t ever get the chance to develop their own ideas (which might quite possibly be better than the ones you handed them). I would also worry that the kids would not get the chance to experience different approaches to teaching – that it would all start to feel awfully ‘samey’ when you have to sit through it 5 days a week, 38 weeks a year. I think behaviour is a separate issue from teaching and learning, because in that, consistency of approach is about fairness to the children. They need to know where they stand. When it comes to learning, the element of surprise can be really valuable. Sums up the counter arguments perfectly. I have known teachers whose style is totally different to mine, yet children’s “academic outcomes”(hate that phrase!) were broadly the same. I would have hated to be forced to teach like them and they would have hated being forced to teach like me. Also In secondary, according to the surveys, the workload driver was not so much planning, but meaningless data shots for all classes every few weeks. I think this is reasonable position for experienced teachers. My issue is really that, too often, new or less confident teachers are left to flounder because there isn’t a firm enough platform or culture of sharing and collaboration. Or, simply, colleagues are creating work for themselves hunting out the same resources or making new ones. There’s nothing here saying ‘no autonomy’ or that everyone must teach in the same way – just a question of degrees. I agree with that. It’s a place you reach through experience and expertise. But an awful lot of time is lost and anxiety generated with assembling materials instead of working out how to use them. At my new school we meet for a period each week to discuss the next week in our SofW and discuss ideas of how to teach some of the ideas best, swapping experiences and resources which are linked to an online SoW in excel. We look at practical equipment and share ideas of its best use; especially for new equipment or really old / odd stuff that most people would brush past in the prep room ! We’ve updated our longer term planning based on how well things are going. Having moved over to try the independent sector this is the stand-out improvement in my opinion in helping us all teach a little better. “I want to teach so my students can do well on tests”….and I want to teach so my students can do well in LIFE. Focus on kids not tests. I am a teacher with 20 years of experience at the same school in the same classroom. I want FULL TEACHER AUTONOMY. I know what is best for my students, their needs and their learning styles. If I truly want to meet their needs I don’t need (or want) a predetermined, “canned” set of resources. One size doesn’t fit all.